Dejan Lovren (left) hit the winner on a night Liverpool boss Jurgen Klopp described as "brilliant, outstanding, emotional"
Jurgen Klopp evoked Liverpool's remarkable Champions League win over AC Milan in 2005 as the Reds came from 3-1 down to beat Borussia Dortmund in a dramatic Europa League quarter-final. The Reds needed to score three goals in the last 33 minutes to progress. And Dejan Lovren's injury-time header at Anfield sealed a dramatic comeback. 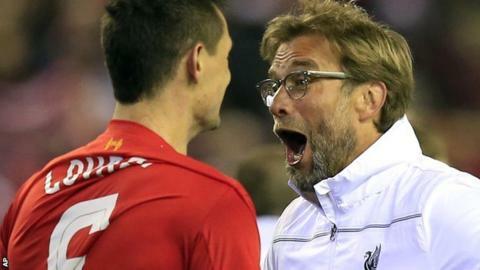 "I reminded the players about Liverpool being 3-0 down in the Champions League final," said Reds boss Klopp. "It was brilliant, outstanding, emotional." The Merseyside giants found themselves facing a similar task on Thursday night after Dortmund scored twice in the opening nine minutes through Henrikh Mkhitaryan and Pierre-Emerick Aubameyang. That put the visitors 3-1 up on aggregate after the first leg had ended 1-1. "Very often in football the game is over then but not here, not with this Liverpool team," said former Dortmund boss Klopp. Divock Origi, who scored in the first leg, reduced the deficit for the home side but the tie looked all but over when Marco Reus put the German side 3-1 up on the night and 4-2 ahead on aggregate. "That is the moment in football and life when you have to show character and that's what the lads did," added Klopp. "It was pretty cool to watch. "We needed three goals and I said that, even if it is not really likely, it is possible and we should try to do it." Goals from Philippe Coutinho and Mamadou Sakho pulled Liverpool level and set up a thrilling finale in front of a raucous crowd. Then Lovren nodded home James Milner's cross from the right to seal a dramatic win and secure Liverpool's place in the last four alongside Sevilla, Shakhtar Donetsk and Villarreal. "I know this is a place for big football moments," said Klopp. "I will not forget it because it was special. Now we have to carry on and try to do it more often." Origi said: "The coach said we had to create a moment to tell our grandchildren or children about, to make a special night for the fans. We believed in it. "When we scored the first goal, we all felt it would be a special moment." The 20-year-old praised Klopp for his approach. "The manager was very calm, surprisingly calm," he said. "That's the class of a big manager. You could see no panic, no stress, he believed in us and in the end it helped. "We had nothing to lose. We just had to go. We had to play and show our qualities and believe in ourselves and at the end we could win." The semi-final draw takes place at 11:30 BST on Friday. Dortmund boss Thomas Tuchel had no answers when asked how his team lost a game they controlled for long periods. "If you expect an explanation, I have to disappoint you," he said. "It was not logical. It was very emotional. "It was an atmosphere when I think everybody except our supporters believed it was meant to be. It was destiny. "If you think about the Champions League final with AC Milan when Liverpool came from 3-0 down to win, that contributed to the energy and belief in the stadium. Then everybody believed in the lucky punch. "We wanted to win like champions, now we must at least lose like champions and pick ourselves up. "We don't need any sympathy or a pat on the back. All congratulations to Liverpool." ...as did Atletico Madrid forward Antoine Griezmann. How good is Liverpool's record in Europe? Read more on How good is Liverpool's record in European competitions?